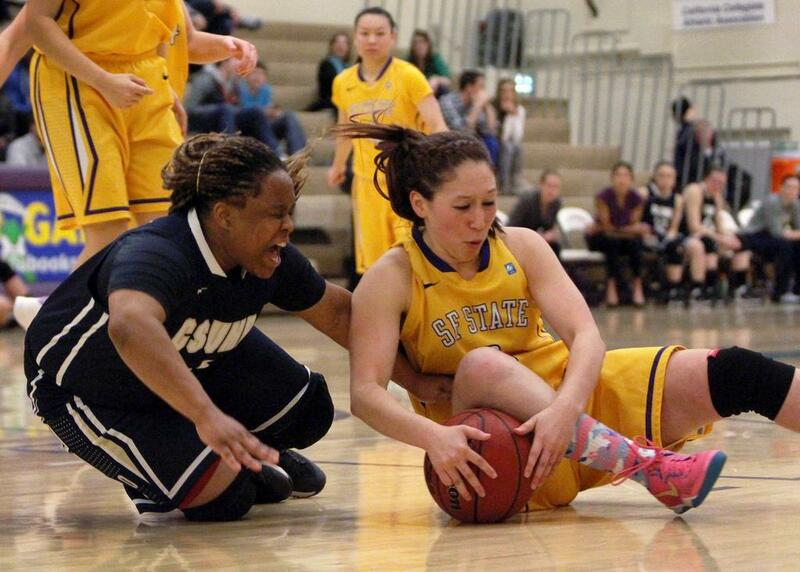 UPDATE: Beginning Senior Night with positive thoughts after their loss to Cal State East Bay the previous night, SF State’s women’s basketball team could not overcome the Cal State Monterey Bay Otters’ shooting, ending the Gators’ regular season with a 61-50 loss. Seniors Lauren Varney, Kimmie Fung, Katie Batlin, Jennifer Le, and Angela Van Sickel gave their final farewells to Gator basketball after the game and continue on to the next chapter of their careers. Batlin closed her collegiate athletic career leading the Gators with a game-high of 18 points, while Lauren Varney followed contributing a total of 11 points. The Gators began the game with a 6-0 lead, but the Otters quickly matched them and acquired their leading stance, closing the first half with a three-point lead on the Gators. The Gators’ lack of shooting success plagued them in the long run. Presumably due to disappointment of the loss to Cal State Monterey Bay, the Gators, including head coach Dr. Joaquin Wallace, declined to comment on tonight’s game and all other matters. With this loss, the Gators close this season standing 14-14 overall and 10-12 in CCAA. Coming into tonight’s game with their heads up from their loss the previous night, the women’s basketball team played an excellent game but could not overcome the Cal State Monterey Bay Otters’ shooting, ending the Gators’ regular season with an unfortunate 61-50 loss. Graduating seniors Katie Batlin and Lauren Varney closed their collegiate athletic chapter tonight leading the team with a combined total of 29 points. Aside from the unlucky loss, the Gators fought until the end, ending the season with a strong and impressive game.